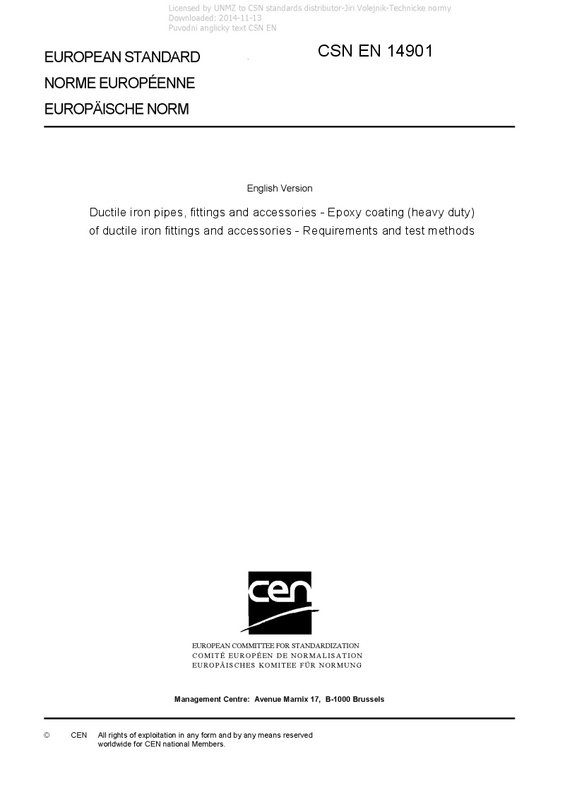 EN 14901 Ductile iron pipes, fittings and accessories - Epoxy coating (heavy duty) of ductile iron fittings and accessories - Requirements and test methods - This European Standard defines the requirements and test methods for factory applied epoxy coatings (fusion bonded powder or liquid two-pack) used for the corrosion protection of ductile iron fittings and accessories conforming to EN 545, EN 598, EN 969, EN 12842, EN 14525, for: - conveying water (e.g. potable water) at operating temperature up to 50 °C excluding frost; or - conveying waste water at operating temperature up to 45 °C excluding frost; or - conveying gas at operating temperature up to 50 °C; - suitable for external environments, i.e. soils, waters and atmospheres of all common corrosion loads, characterized in EN 545:2010, D.2.3.